For the last decade, New Mexico’s Oil Conservation Division has been like a traffic cop that can’t write speeding tickets. That’s the metaphor advocates give for a bill that would reinstate the division’s right to issue fines for bad actors, which, amid booming oil business in the southeastern parts of the state and an increase in spills documented by the department, have hovered near zero. The state’s highest court in 2009 ruled the division couldn’t issue fines because the Oil and Gas Act didn’t grant it that authority. “If you look at the way the penalties were collected, it basically fell off a cliff, and the last administration didn’t show any interest in actually enforcing our oil and gas regulations, so I think it’s time that we stepped up and got back to doing that,” said Rep. Matthew McQueen, D-Santa Fe. McQueen and Sen. Richard Martinez, D-Española, are cosponsoring SB 186, legislation that would empower the Oil Conservation Division to once again issue fines. For those looking to the governor to make good on her climate change agenda, the bill could prove pivotal. If passed, along with spilling liquids, the division could issue fines to operators who excessively vent or flare methane, a potent greenhouse gas, to bring them in line with new methane emission rules promised by this administration. Part of New Mexico’s Department of Energy, Minerals, and Natural Resources, the Division is tasked with overseeing the oil and gas industry. It issues permits for new wells, tracks production data, and enforces state rules. 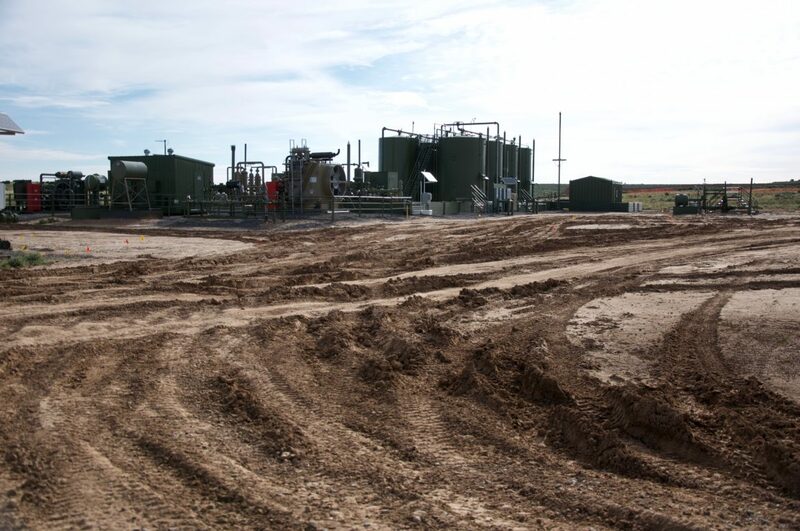 But the New Mexico Supreme Court ruled in 2009 that existing statute, which dates to 1935, does not allow the division to fine companies for spilling, leaking or otherwise illegally discharging hydrocarbons, fracking fluid, or volatile organic compounds. That case, brought by Marbob Energy Corporation, left the task of pursuing fines to the Attorney General’s Office. Statute also held the maximum penalty at $1,000. Judges noted in the Marbob case ruling that the existing law is outdated and inadequate. The year before the ruling, the division collected $479,250 in civil penalties. Two years later, that number dropped to zero. At the same time, the number of rule violations reported by the division increased, according to data on quarterly inspection and penalty reports reviewed by Earthworks Oil and Gas Accountability Project. Over the last 10 years, that number climbed from 1,042 to 1,712. The environmental group also found the leading cause of those spills was equipment failure, like split hoses, broken pumps, and frozen valves, that most often released polluted water. The water emerges from a well along with crude oil and gas, and is often salty and laced with oil droplets and toxic compounds. Sometimes, it’s radioactive. The association has encouraged its members to remind lawmakers that oil and gas produces one-third of the revenue for the state’s general fund and 100,000 jobs, with an average annual salary of $70,000. Legislators have brought up concerns around other bills that ratcheting up regulations could lead companies to abandon wells or move their business across state lines. This legislation may see similar pushback. The proposed legislation, scheduled for its first committee hearing in Senate Conservation tomorrow, would increase fines to up to $15,000 per day of a violation. If a company fails to meet a court order or compliance order, that increases to $25,000 per day. The current law requires proof that the company knew it was breaking the law even to assess civil penalties, and this act removes that standard except for criminal cases. If a person knowingly breaks the Act, its rules, or other orders or permits, including making false statements or omitting or destroying information on forms and records, they could face third-degree felony charges and up to three years of jail time. The committee could see substitute language in the bill as early as tomorrow, meaning some of these details could change. The revisions bring the Oil and Gas Act in line with similar provisions from the Air Quality Control Act, Water Quality Act and Mining Act. This revision also adjusts Oil and Gas Act text from persistently referencing commissioners by “his” and “him” to non-gender-specific pronouns. Gov. Michelle Lujan Grisham has signed an executive order committing the state to reducing its climate change-causing greenhouse gas emissions, including regulating methane emissions from oil and gas production. Fines aren’t the only way to enforce state rules around oil and gas, Tom Singer, senior policy advisor with Western Environmental Law Center, pointed out. Permits can be pulled or denied at reapplication, or production could be limited, he said, though he could not recall a time he’s seen the division exercise that authority. When it comes to methane, just obtaining detailed information on leaks from the state has been a struggle. Lobbyist Tom Horan talks to the House State Government, Elections and Indian Affairs committee about why he opposes a lobbyist disclosure bill during the 2019 legislative session. An effort to require more transparency from lobbyists passed its first hurdle in the House.